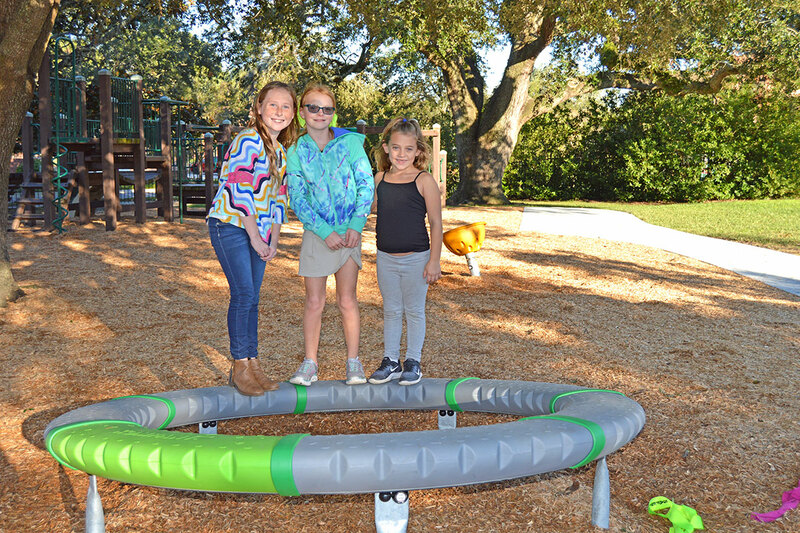 San Marco children enjoy new playground in Landon Park - The Resident Community News Group, Inc. | The Resident Community News Group, Inc.
San Marco children flock to Landon Park to enjoy the new Kompan play equipment installed by the city in November. 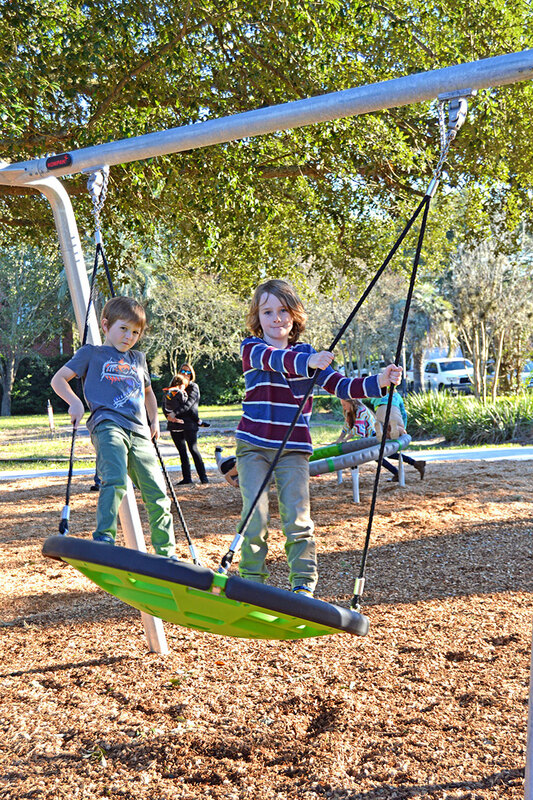 Dozens of neighborhood children flocked to San Marco’s Landon Park Nov. 16 to enjoy the new state-of-the-art Kompan equipment recently installed by the City of Jacksonville. 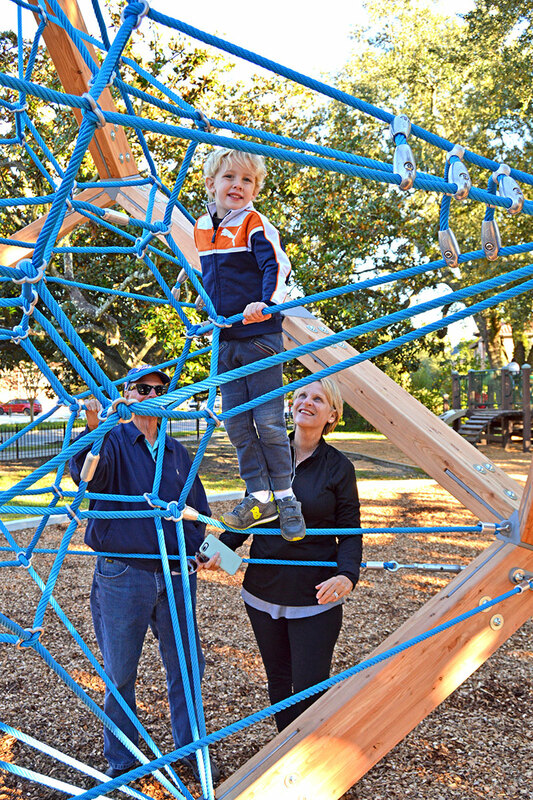 It took two years of careful planning by the City of Jacksonville and the San Marco Preservation Society (SMPS) to finally bring to fruition the new playground equipment in Landon Park. In order to become compliant with the Americans with Disabilities Act (ADA), the City spent $85,000 to refurbish the park with new Kompan play equipment and other new amenities. Among the new features are two ADA-compliant paths, a picnic area, new swings, a cube, “spinner bowls,” and a “super nova,” as well as a refurbished drinking fountain. Kompan playground equipment is carefully designed to stimulate certain types of physical play, social interaction, and learning capabilities. Some of the old playground equipment will still remain, but the tall steel slide that has been a fixture in the park for decades has been removed. Also in the works is a new, refreshed formal rose garden, which will be planted by the San Marco Garden Circle in January. Having lost most of the bushes to saltwater intrusion during Hurricane Irma in 2017, the Garden Circle has already removed all the old plantings and plans to replace them with 100 boxwoods and 24 rose bushes. Enjoying the new playground equipment at Landon Park were Katherine Cumbow, Abigayle Moore and Amelia Taras. Mason Boone climbs in the Kompan cube as his grandparents, David and Dorothy, watch. Louis Wilcox and Luke Otto enjoy the new Kompan swing at Landon Park.